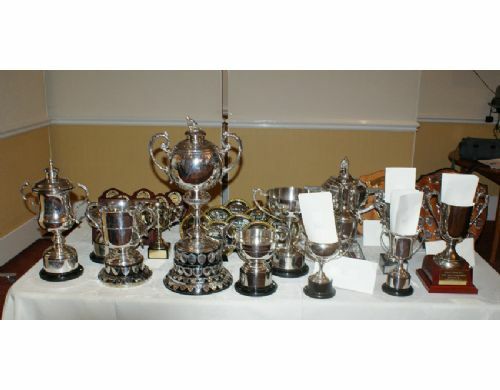 The glittering array of trophies before the presentation of the awards started. 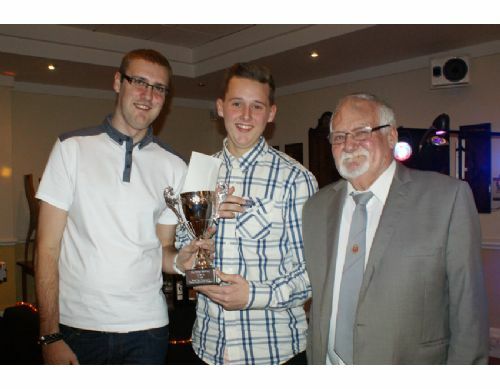 Not a bad season after all! 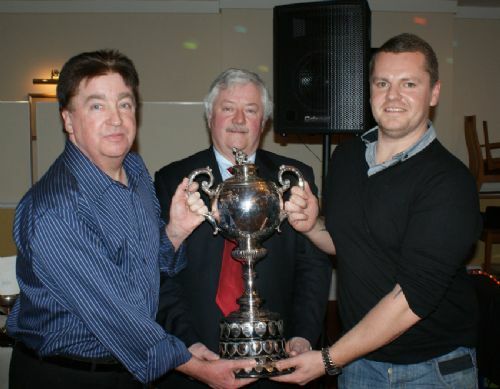 Cheshire County Bowling Association Competition Secretary Jim McGurk presents Mike Geraghty (Captain) and Gareth Gwilliam (Ice Man) with the magnificent Brunner Cup. 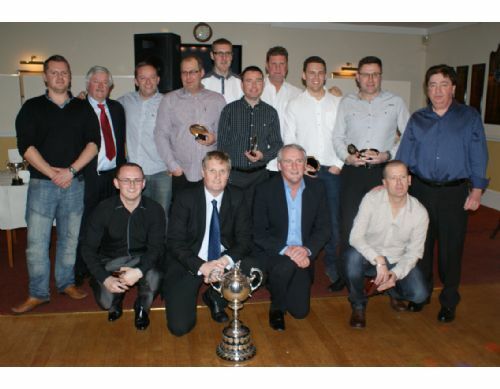 The entire Brunner Cup winning team pose proudly with the Brunner Cup and Cheshire County Bowling Association Competition Secretary Jim McGurk. 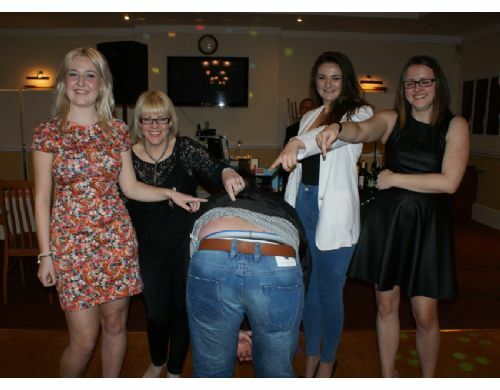 Well played one and all. 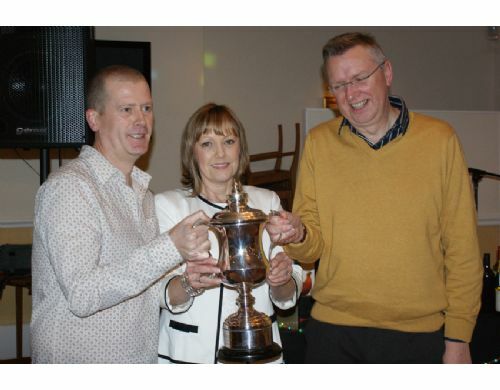 Anne Lane niece of the late great Andrew Tann presents Pete Smith & Roger Morgan with the British Parks Team Championship Trophy. 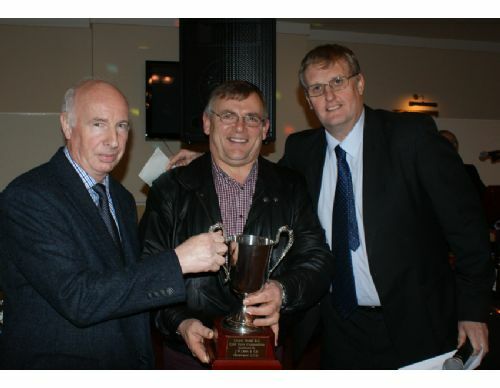 Cheshire County Bowling Association Competition Secretary Jim McGurk presents Club Chairman Dave Phillips and Ben Phillips with the Inter League Championship Trophy. 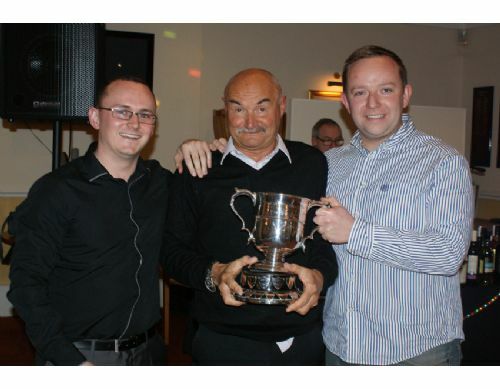 Dave Leigh President of the Altrincham & District LV League presents Michael McDonnell & Chris Alderson with the prestigious 1st Division Championship Trophy. 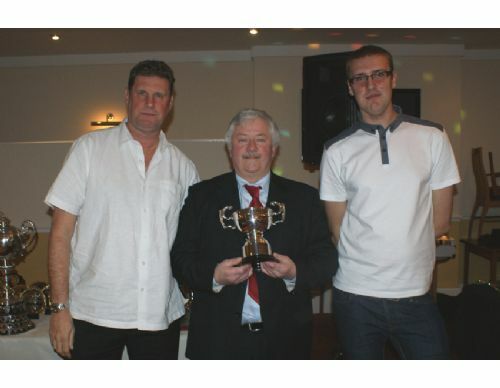 Jack Taylor Chairman of the Metros Sports & Social Club Bowling Section presents Steve Cook & Craig McGuigan with the Metros Sports 6 Man Team Trophy. 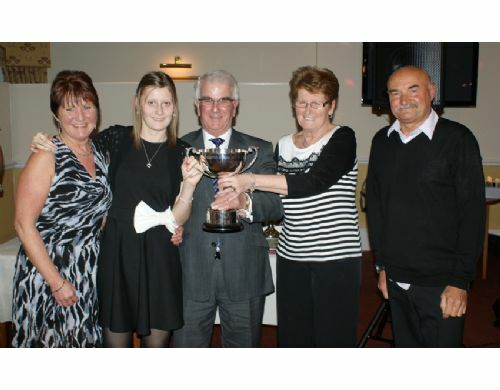 John Sleigh Secretary of the Trafford Evening Bowling League presents Carol Howarth, Amanda Ridley and Charlotte Hough with the Trafford Evening League 1st Division Championship Trophy. 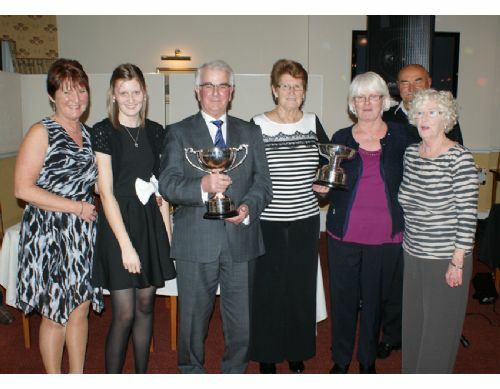 Dave Leigh and John Sleigh present Carol Howarth, Amanda Ridley, Charlotte Hough, Sheila McCormack and Maureen Morgan with the Trafford Evening League 1st Division Championship Trophy and the Cheadle and Gatley 1st Division Championship Trophy. 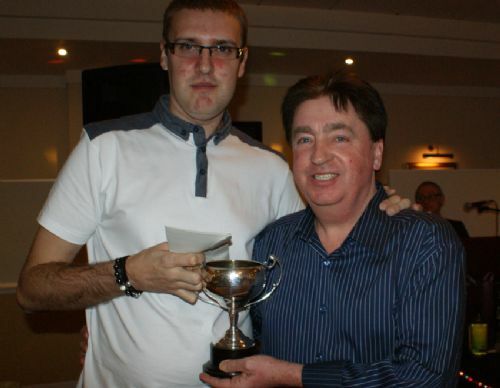 Club President Alan Wilkinson presents James Mills with the Clubman of the Year Trophy. Well deserved James it was well deserved. 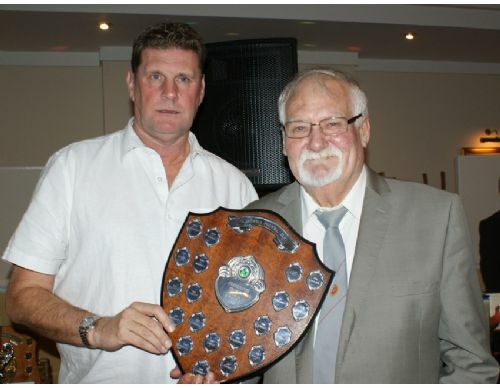 Club Chairman Dave Phillips and Steve Ridley show the award winning female rear of the year to the delighted audience. 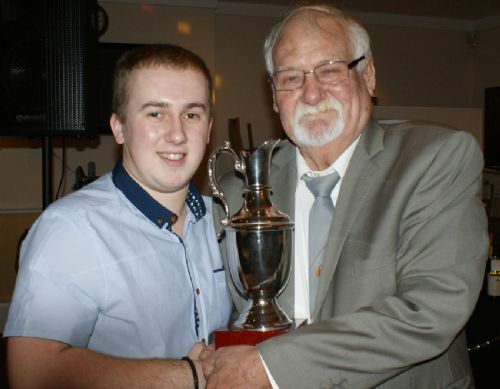 This years presentation evening was held on Saturday 25th January 2014 at the superb Davyhulme Park Golf Club. 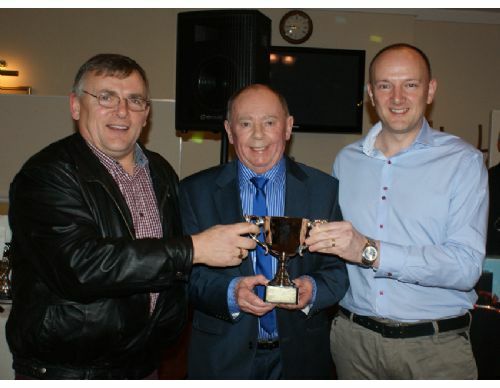 Guests on the evening included Cheshire County Bowling Association Competition Secretary Jim McGurk. 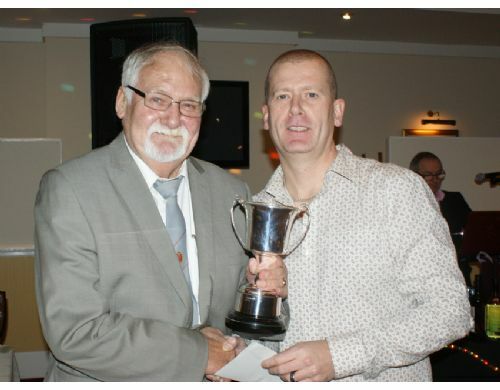 President of the Altrincham & District LV League Dave Leigh. 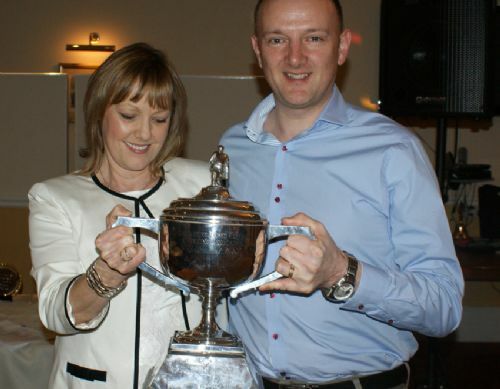 Trafford Evening League Secretary Mr John Sleigh and Anne Lane, the niece of the late Andrew Tann.